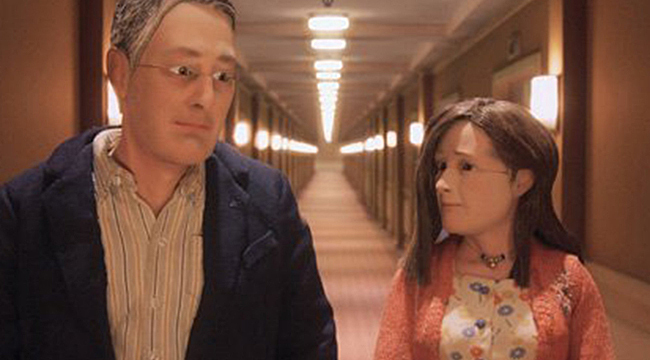 Since it hit the festival circuit last year, Anomalisa, the stop-motion animation film about a self-help author (David Thewlis) who falls in love with a customer service rep (Jennifer Jason Leigh) while on a business trip to Cincinnati, has racked up some serious awards. The movie won the Grand Jury Prize at the Venice International Film Festival and was just nominated for an Oscar. Co-directors Charlie Kaufman and Duke Johnson recently phoned us to talk about the movie. How did you first come up with the concept for the story, which was first produced as a play? Kaufman: I was doing a series of sound plays with Carter Burwell and the Coen Brothers. They were basically stage radio plays with musicians on stage and actors reading scripts along with a Foley artist. I had written one and the Coens had written one. We traveled with it a bit. I wanted to take it to Los Angeles and they couldn’t go. I had to write a second one to replace theirs. I was under the gun. I had read about the Fregoli delusion which is the belief that everyone else in the world is the same person under disguise. I thought it was interesting metaphorically and kind of interesting in terms of a sound play. It would allow me to have one actor play many parts and I couldn’t afford to have many actors anyway. It was a pragmatic solution to that problem. That’s where the idea came from. I liked the idea that there would be one person playing all these characters that the other character interacts with until late in the play when a third voice is heard. How difficult was it to transform the play into a film? Kaufman: It was like embarking on any film project. You have to figure out what you want to do visually and how you are going to express the lives of the characters. We had to design the characters and figure out how to utilize this type of animation to make it work. Once we got the money from Kickstarter, we recorded the actors, which is what you always do with animation. We did that first and it informed a lot of the tones we were going for visually. Kaufman: I don’t feel like that part was difficult. It was work and there was exploration and trial and error. It felt productive to me and exciting and to see it come together and see the sets and the design and everything come together. During production, things got a lot more difficult and a lot more expensive. Johnson: Not specifically. The challenges were creating something new. We weren’t drawing from any sort of references. We were forging our own aesthetic and our own approach to stop motion and figuring out what that is and what that looks like and how to achieve this emotional authenticity that we were going for. What made you want to use stop-motion animation? Johnson: I was working at an animation studio called Starburns Industries. One of the owners is Dino Stamatopoulos [who played Starburns on the sitcom Community]. I had directed some of Dino’s stop-motion TV shows. We had talked over the years about wanting to use stop-motion to explore more adult stories. One day, we were talking about ideas we had of things we could produce next in the studio. He had a copy of the script for Anomalisa and I read it and loved it and that’s what started it out. We approached Charlie with that in mind. How’d you go about casting the voices? Johnson: They’re the same actors that were originally in the same performance that Charlie did in 2005. Kaufman: They’re three of my favorite actors. When I was looking to cast the play, I approached people I liked and who I thought would be fun to do something with. I didn’t really know them at the time. That was the reason. I had seen work they had done that I really admired. They ended up being nice people too. One of the main motifs is the concept of customer service. Talk about how that functions as a theme in the movie. Kaufman: The main character is an expert in customer service. He’s written a best-selling book about customer service. I had done a lot of customer service. I had done phone work before I could find work in Hollywood. I have a lot of experience with it. I think it’s funny that there would be somebody who is a celebrity in that field. I know the field so it was an easy thing for me to draw on. It has an ironic element in that this character can’t really interact with people in a real way. That’s arguably the type of interaction you do as a customer service representative. The movie is set in Cincinnati in 2005. Talk about the significance of the setting. Kaufman: That was the year I did the play. I wrote it as if it were taking place in the present. When we did the movie, we didn’t see any reason to alter it. There are references in the piece that are specific to that year and that time. It felt natural to keep it in Cincinnati. I don’t know why I chose Cincinnati. I was looking for a place in this part of the country, mostly somewhere close to where Lisa lived. I like the sound of Cincinnati. I have never been to Cincinnati so I have no specific feelings about it one way or the other. Kaufman: I’ve never been to Akron but I did have a girlfriend from Cleveland she once sent me a postcard of Akron and it had a giant tire. That’s what I remember about Akron. One of the characters sings the Cyndi Lauper song “Girls Just Want to Have Fun.” How’d you end up picking that particular song? Do you guys plan to work together again? Duke: We’ve talked about it a lot. We talked about wanting to do this again. It depends on whether or not Anomalisa is financially successful to the point where someone thinks it’s a good investment to do another one. We enjoyed it very much. Did the Kickstarter campaign work as well as you thought it would? Johnson: It did work. I don’t think this film could have been made another way. We pursued other traditional avenues for funding and it wasn’t working out. We did have a sense that we wanted to do this our own way without anyone looking over our shoulder. Kickstarter worked for us. It got us the attention of Snoot Entertainment, who came on to finance the rest of the film. A lot of that was very lucky. Had Snoot not come on, we wouldn’t have been able to finish the film. It brings along its own challenges as well. We didn’t have anyone looking over our shoulder but we also didn’t have any money. It was very difficult. It must be vindicating to have received so many awards since you had to work on your own instincts. Kaufman: I think it’s a relief. So much time was spent on this and so many years. If it had disappeared without a trace afterward, it would have been very difficult for all of us. That it’s getting positive attention is vindicating or something. It’s certainly a relief.